You will be given a reference e-book to read which has 671 pages And the test will be based on that e-book , you can take final test within 1 year of purchase. Software management is a crucial position in the technology industry. In software management, a professional or series thereof must oversee the direction and completion of complicated software development projects. Without their direction, resource management and motivation, the skilled and pressured software developers would be remiss to successfully see their projects through. This is very much the computer age. For decades, futurists spoke of the coming of a great computer age, when electronic thinking machine would become integral to nearly all facets of daily life. This age has most certain way arrived. Unfortunately, these machines are not perfect. They require complicated instructions containing logic and flow in order to process input and produce output in the sophisticated ways in which humanity needs. This is where software comes in, and by proxy the developers and their software project management staff. Since computers are not going away, in fact they are increasingly infiltrating daily life, there will be a continued need for software, software developers and ultimately professionals in software project management. This is a lucrative field, and even in the worst economic climate, there will be an unabashed demand for people in software project management. As such, this is one field that employment seekers can always turn to no matter what the job market is like. Unfortunately, a software project manager must have an understanding of technology, programming, human resources, and general project management. If someone wants to enter the field of project management, then a software project management certification is necessary. In order to gain this certificate, one must complete a software project management course. The question, therefore, is pertaining to which method is best for pursuing this learning. In fact, the best way to do it is through online certification. Online certification eliminates the classroom, which in and of itself removes a whole lot of problems. Without the conflicting schedules, costly tuition and commuting, online certification allows a busy professional to study on their own schedule. But, not all online certification providers are of equal quality, and there's bound to be one that's the best of all. Which one is it? Brainmeasures is the leading online certification provider. This is because we travel the extra mile to ensure that our courses are not only completely inclusive, but that we also managed to convey some sense of experience to the student. We do this in a rather unique way. Our professional course designers collaborate with experienced officials in any field we teach. These experienced professionals not only help to ensure the inclusiveness of the material, but they have stories to tell. We use the stories as examples for teaching and our courses, along with whatever pertinent information there is on how a particular problem was solved. By doing this, we are able to give the students an understanding of the practical application of what they learn before they even finished the course. No other certification provider attempts this, let alone at our amazing prices. This consists of our software project management course, followed by our software management exam. Upon completing the soft where management exam, a certificate is awarded. 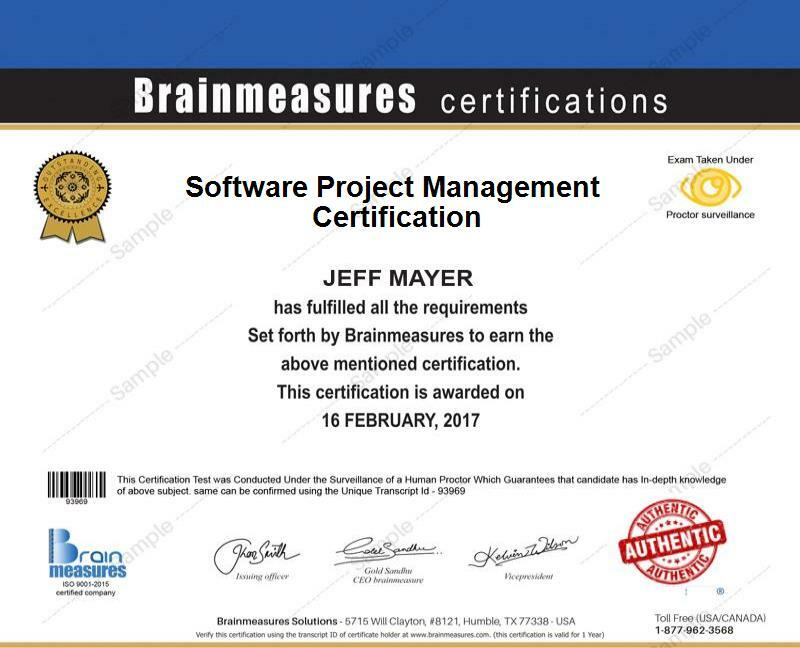 This certificate signifies a full and complete software project management certification from Brainmeasures. This course is designed to be accessible to pretty much anyone. That said, the best kind of individual to be suited to the software project management field is someone with a flair for management in general as well as a love for technology – especially computers. But, anyone could pick this field up through the magic of Brainmeasures. Salaries can vary a bit depending on which field is chosen, but the general range for this certification is between $90,000-$300,000 a year, with promotions often leading to an up or range as high as $500,000 per year.